Poets : Tirujnanasampanthar, Appar, Sundarar pongunool maarpineer puthappataiyeer poonkangai thankucen cataiyineer caamavetham othineer enkum ezhilaa maraiyorkal muraiyaal eththa itaimaruthil mankultoy koile koilaaka makizhntheere. -Tirujnanasampanthar This is the 30th holy place in the southern banks of Kaveri consecrated by Thevaram. In the month of Thai – Thaipoosam – 10 days festival – Brahmotsavam. Everyday there will be the procession of the Lord, both in the morning and evening, in different carriers. On the 10th day, the festival gets completed with the ‘theerthavaari’. In the Vaikaasi month – the grand Vasanthotsavam festival for 10 days – Tirukkalyaanam festival, Ambaal tapasu, Ambaal ‘thannai thaane’ prayer festivals are conducted with fanfare. In this holy place, Thiruvaathirai, Aaadipooram and Karthigai are celebrated in a significant manner. On the monthly, ‘pratosha’ days, the devotees in large number throng the temple. On the important festivity days like Deepavali, Pongal, Tamil / English New Year Days, special poojas and abhishekams are performed. The Lord of this holy place graces us as ‘swayambu moorthi’. 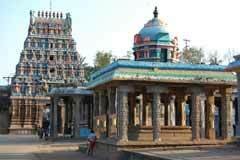 The Thiruvitaimaruthur Mookambigai of this place is as famous and great like the Karnataka Kollur Mookambigai. 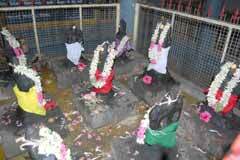 In India, only in Kollur and Thiruvitaimaruthur, Mookambigai shrines are seen. The temple is open from 6.00 am to 11.00 am and from 5.00pm to 8.00 pm. 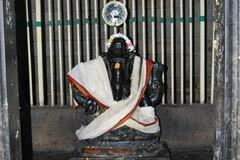 Arulmigu Jothi Mahalinga Swami Tirukkoil, Thiruvitaimaruthur - 612 104, Thanjavur District. There are four Vinayaka temples in the corners of the four streets where <?xml:namespace prefix = st1 ns = "urn:schemas-microsoft-com:office:smarttags" />Temple Car is pulled. At the ‘theradi’ (the Car Station) is the Vinayaka temple, in the East Street the Viswanatha temple, in the West Street is the Rishipureeswarar temple, in the South Street Aatmanaatha temple and in the North Street is the Chocknaatha temple. 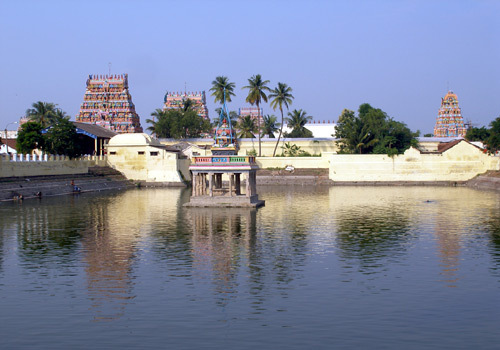 Lord Mahalingeswarar sits in the middle amidst these temples. Hence, this holy place is identified as “panchalinga sthalam”. The Vinayakar of this place is known as “Aanta Ganapati”. Devotees in large numbers come and worship the Mookambigai shrine, since it is considered to be powerful. The married couples worship intensely that they should conceive without any problems and beget babies. Likewise, women pray for safe delivery. This kind of worship significantly prevails in this shrine. Devotees who circle methodically the big prakaaram and then worship the Prime Deity are surely relieved of mental aberration, psychic depression, madness and like sicknesses. That they enjoy great relief and happiness could be seen even today. By worshipping the Prime Deity, Lord Mahalinga Swamy, one’s sorrow and unhappiness are alleviated. Those who wish for good marriage and those who long for offspring can perform prayers here. They will get mental peace. Moreover, one can pray for job attainment, enhancement in business and promotion in the job. The Lord definitely grants their wishes. Abhishekam can be performed to the Lord with ingredients like milk, curd, panchamirtham, rice flour, honey, rosewater, soft coconut water, sandal paste, vibhuthi, rice powder and tamarind powder. We can also don the Lord with new dhoti, Ambal with new sari and offer food to the devotees who come to the temple.. We can offer ‘naivedyam’ to the Lord and distribute it to the devotees. We can also participate in the regular pooja, abhisheka performances. Those who can afford can donate to the temple renovation. Mookambigai : The Thiruvitaimaruthur Mookambigai of this place is as famous and great like the Karnataka Kollur Mookambigai. In <?xml:namespace prefix = st1 ns = "urn:schemas-microsoft-com:office:smarttags" />India, only in Kollur and Thiruvitaimaruthur, Mookambigai shrines are seen; it is not found anywhere else. Only here a separate sanctum could be seen. In this temple, the Mookambigai sanctum is on the southern side of Ambal’s sanctum. The inner sanctum of this temple is constructed like the North Indian temple structure. In this sanctum, the most powerful Maha Meru Srichakram is installed. Moola Linga Sthalam : According to the rules of temple structure, Lord Mahalinga Swamy remains as the central Prime Deity in this temple, amidst the temples and surrounded by deities. They are: Tiruvalanchuzhi-Vinayakar, Swamimalai-Murugan, Sejnalur-Chandeswarar, Sooriyanarkoil-Sooriyan and other nine planets, Chidambaram-Natarajar, Sirkaali-Bhairavar, and Thiruvavaduthurai-Tirunandhi. This is a very significant feature. Aswamedha pratakshinam : Reaching the temple and circling the inner way of the first wall, to worship the Lord Marudapperumaan is known as ‘Aswamedha pratakshinam’. Those who do this will receive all benefits. Before beginning this sacred exercise, one should worship Lord Muruga . One has to limit his prayer duration as one, half and quarter mandalams. The going around also must be stipulated as one hundred and eight, twenty-four, twelve and seven circles. It is believed that the devotees who circle around on the Thirukarthigai Deepam day and during the Thai month festival will receive immense benefits. Next to this is the ‘Kodumudi prakaaram’. To go around this prakaraam is equal to going round the Mount Kailas and receive benediction. 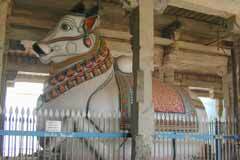 Pattinathaar and Badragiriyaar : The life-history of Pattinathaar and this Thiruvidaimaruthur temple has close connection. 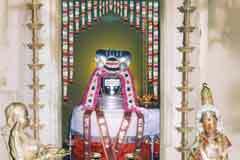 Pattinathaar has sung many songs on the Lord Maruthavaanar of this temple. His disciple is Badragiriyaar, who was a King once upon a time, renounced everything and became the disciple of Pattinathaar. 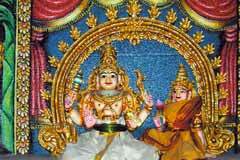 Both the guru and the disciple went on pilgrimage to all the Siva temples, came and stayed at Thiruvidaimaruthur. Pattinathaar never kept even a begging bowl. On the other hand, the disciple had a begging bowl and also a dog. Once the Lord disguised as a Siva-devotee came and asked alms to Pattinathaar who told Him: “ I am a beggar. I do not have anything to give. There’s a family man near the west tower of this temple.” The Lord went to that place and begged Badragiriyaar, who realized and felt sad that the begging bowl and the dog had made him a family man. Thinking so, he threw the bowl on the dog. The begging bowl broke and the dog also died. The Lord then appeared before him and granted moksa to Badragiriyaar and also to the dog. That place could be seen even today. It is called the ‘Naayatiyaar Koil’ in the East Maada Street. One can see this site in this sacred place. 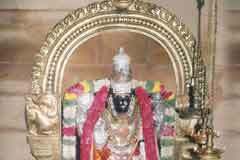 The Sacred Place where Lord Mahalinga worshipped Himself : This holy place is situated between Mallikaarjunam Sri Sailam in the North and Thiruputaimaruthur (Putaarjunam) of the Tirunelveli District in the South, and is called ‘Itaimaruthu’ (Madhyarjunam). The Sanskrit word, ‘Arjunam’ means ‘maruda tree’. The sacred tree in all these three places is the maruda tree. Lords Saturn and Moon have worshipped here. 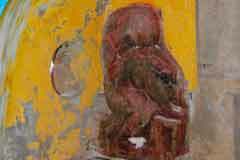 To the sage Kasyapa, the Lord of Itaimaruthu, Lord Marudavaanar has appeared as child Krishna. There are about 32 theerthams (holy water) like Kaarunayaamirtha Theertham and Kavirippoosa Theertham. For the 27 stars, there are 27 lingams. On the four sides are temples for Viswanaathar, Aathmanaathar, Rishipureeswarar and Chockanaathar and so this place is called ‘Panchalingasthalam’. Varaguna Pandiyan came to this sacred place and got relieved of his ‘brahmahatthi dosha’. Since Pattinathaar, Badragiriyaar, Varaguna Pandiyan, Arunagirinaathar and Karuvoor Thevar have worshipped the Lord here, this place has become quite well-known. Here Badragiriyaar and his disciple attained mukti. Pattinathaar has sung many songs celebrating this place. The four Nayanmaar, Appar, Tirujnanasambandar, Sundarar and Manickvaasagar have composed ‘Thevaram’ songs consecrating this temple. Arunagirinaatar have celebrated this place in his ‘Tiruppugazh’. Those with ‘Anusha’ star can be relieved of their afflictions in this place. Sage Agasthya, along with the other sages came to Itaimaruthur and performed tapasya meditating on Goddess Umadevi. Goddess Uma also appeared before the sage. The sages accordingly worshipped the Goddess and requested that they would like to see the Lord also. Umadevi, for the sake of the sages, went in Sivatapasya. The Lord granted Her wish and appeared before Her and the sages. After appearing before them, the Lord began worshipping the ‘Jothi Lingam’. 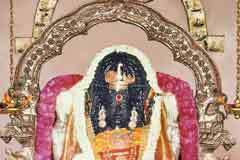 The surprised Umadevi asked the Lord: “ O Lord! It is the practice that Brahman and other deities worship thee. But, thou art worshipping thine own self!” The Lord replied: “Uma Devi! We are the Ultimate who worship and accept worship. It is because these sages have forgotten to worship us, we are worshipping ourselves. That is why I’m worshipping myself.” The Legend says that from that day onwards the sages performed worship according to the ‘Kaamika Law’ and received great benefits. Thiruvidaimaruthur is in the Kumbakonam-Mayiladuthurai road. Adequate bus services are available from Kumbakonam. Distance from the important cities : Kumbakonam – 9kms; Thanjavur – 40 kms. ; Aduthurai – 3 kms.